← What do ADHD and Autism have in common? 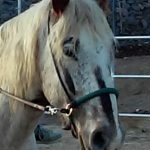 There is always a lot of press, at least here in Nevada, about our countries wild horses. There are many great rescue organizations and lots of people work very hard to protect them. Once trained Mustangs can go on to do most anything. But getting them started can be challenging and not for everyone. However, there are many amazing programs that partner prison inmates and untrained Mustangs with incredible results. This story from ABC News shares a bit about the experience. We are very proud of the fact that two of the horses that work with us are off the range, prison started mustangs. ‘Sammy Hagar’ come from The Bureau of Land Management (BLM) and the Nevada Department of Corrections–Silver State Industries partnership. He has been with us for over 4 years and is an awesome therapy horse! He is rock solid and willing to try just about anything, even ‘jumping’ as we discovered, much to our surprise, when he jumped a low arena fence during a heard observation activity and when on a run about on the ranch! The other horse we work is ‘Duke’. His owner is kind enough to allow this stunning big boy to help in the work we do. Duke was rounded up and started in the Humboldt area and history has it that this is were the cavalry, when they disbanded, set many of their horses loose. Their herd included many Percherons, a large draft breed, that pulled wagons and could be used as a mount. You can see this Percheron heritage in Duke. He is a big, handsome, stout horse and has the kind and gentle nature that Percherons are known for. Both of these horses are wonderful members of our herd. In the work that we do, they help kids as young as 4, teens and adults dealing with social, emotional and behavioral, as well as mental health issues. So, if you know someone who is struggling, give us a call or send us an email and we can schedule a visit. You will meet our entire herd, take tour and have the opportunity to tell us more about the issues you are dealing with and we will let you know how we might be able to help. This entry was posted in Mental Health, The horses. Bookmark the permalink.